Situated just 10 meters from the sea, with a view on the sea and surrounding islands . 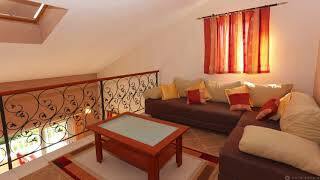 House have 2 apartments 6+2 for 16 persons. The apartments have fully equipped kitchen, sat-tv, air conditioning in every room, parking in the garage, access to the garden with barbecue, private beach with parasols and deck chairs, mooring for a boat.